The spring semester on American campuses is beginning. On some campuses anti-Israel groups will be preparing for another round of the so-called Israel Apartheid Week, which will unfold as the aftershocks of this past summer’s Israel-Hamas war are still being felt. At Temple University a pro-Israel student got into an argument with pro-Palestinian students. Hateful words were said, and the pro-Israel student was allegedly assaulted. Recriminations between pro-Israel and pro-Palestinian students at John Jay College in New York made news in October. Tensions were so high at UCLA in November that rather than contest an anti-Israel resolution before the student government (which ultimately passed), the pro-Israel students decided to sit out the fight. 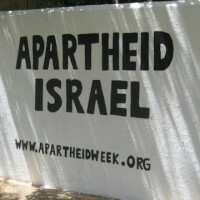 And at Wellesley College, Students for Justice In Palestine (who had put up a poster asking “What Does Zionism mean to you?” on which students wrote “genocide,” “murder,” “apartheid”) refused to meet with their Jewish counterparts, because to do so would violate an “anti-normalization” policy. Events such as these may be repeated on other campuses this spring, as tensions remain high, and some student groups promote petitions and referenda calling for their universities to divest from companies with ties to Israel, or in support of a boycott (really a blacklist) of Israeli academics. Universities are supposed to be places where ideas are held in esteem, and knowledge and truth emerge from rigorous examination and discussion. But we are seeing vilification and hate, instead of discourse. Debate over the Israel-Palestine conflict is often disabled because few can step back and examine the historical, political, religious, and legal issues dispassionately, let alone compare this conflict to others. Instead, passions on both sides are intensified with self-righteousness. When injustices are at stake, dispassionate analysis may strike advocates as inappropriate, even sacrilegious. A cool head persuades some you do not really care. Justice for Palestinians, who have been under Israeli occupation for nearly 50 years is set against respect for the rights of Jews, like other peoples, to have national self-expression in their historic homeland. Campus advocates identify with these narratives, and each side paints the other as unjust, racist, or both. Or in Marzec’s words, “fascist.” This dynamic makes it impossible to conduct meaningful conversations. Winning counts for more than learning. Each side rightly notes that one would not have a civil discussion with a neo-Nazi or a Holocaust denier. If that’s how they see each other, engagement becomes impossible. Everyone therefore has to reduce the amount of anti-racist “justice” they invest in their position in order to talk. Otherwise, rather than classmates engaged in dialogue, you see racists, idiots, and enemies. Add to this the relatively new fashion of some anti-Israel groups opposing “normalization” on campus. It is bad enough that many BDS proponents insist that Israelis should be treated as pariahs (much like Nazis and Apartheid-advocates). It is doubly troubling when such hateful stances are adopted toward classmates, either because of their ethnicity or their political position. It is dangerous when abstract allegiances to people in battles thousands of miles away supersede the respect one ought to exhibit toward fellow students who are neighbors, classmates, and friends. We sympathize with the students who say they are being forced to “choose sides,” when they insist they want to be both pro-Israel AND pro-Palestinian, but there is little space for them on campus. These students have a capacity for empathy. It helps them hold more than one set of thoughts at the same time, and to seek knowledge that challenges, rather than confirms, their beliefs. They see the humanity and suffering of Israelis and Palestinians alike. They reject the hatred that defines each people as mere roadblocks to the other’s aspirations. At best, they are passionate about compassion. And they think backward from the goal (peace and national self-expression for both peoples in their own lands), and focus on how to get there, rather than on how to be extreme advocates for one side or the other. Zealots on both sides dismiss empathy, because each says the other doesn’t deserve it. South African Apartheid leaders were human too, and no responsible person should express empathy for them, so how can one have empathy for similar folk today—those who are seen as responsible for Palestinian or Jewish suffering? But there were very few Apartheid advocates on campus when South Africa was a lighting rod for activism, whereas today there are two camps, each of which can claim justice is on its side. In this environment, learning requires academic leaders—administrators, faculty, and students alike—to display a capacity for empathy. What would it be like to be a Palestinian in Gaza? An Israeli in Sderot? Can you imagine either, both? Can you construct an argument that is logical, comparative, historically and evidence-based that takes a position opposite to your political beliefs? The Israeli-Palestinian conflict could be ideal for demonstrating critical thinking skills—if the environment allowed for thinking rather than slogans, propaganda, hate, self-righteousness, threats, and violence. Our view is that faculty in particular have to work much harder to demonstrate what reasoned discourse means. Cary Nelson is co-chair, and Ken Stern is an executive committee member, of the newly formed 120+ member Alliance for Academic Freedom, a project to protect academic freedom and promote empathy around the Israeli-Palestinian debate. The AAF is an affiliated group of The Third Narrative. Nelson is coeditor of the recently released The Case Against Academic Boycotts of Israel. Stern is the Executive Director of the Justus and Karin Rosenberg Foundation.